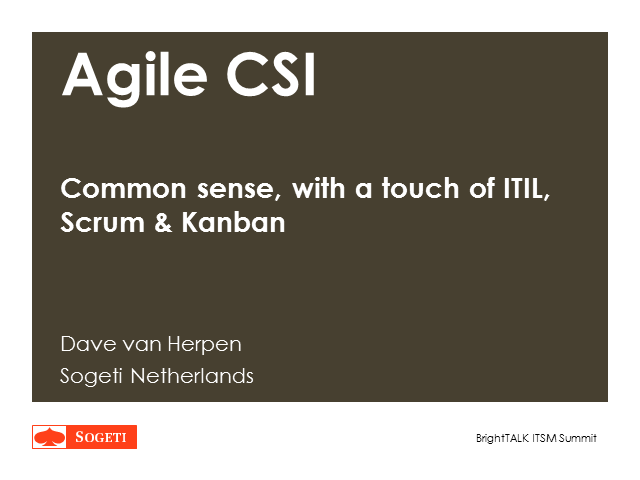 In this webinar the presenter will elaborate on a CSI case study, applying fundamental principles and instruments from ITIL, Agile, Scrum, Lean, Kanban, and…common sense. It is a real life example of how CSI can help an organization to achieve its strategic objectives and deal with dynamic markets. It emphasizes the need to integrate CSI as an indispensable part of BAU (Business As Usual), instead of a separate process or function. In doing so, the presenter will illustrate which principles, methods and instruments have been applied, which lessons were learned and how the required cultural and behavioral change was realized. How does ITIL 4 contribute to the digital enterprise? What is a digital enterprise, for that matter, and which digital capabilities are required? How does the digital operating model contribute to transforming the enterprise? What’s the importance of planned and emergent continual improvement in keeping up with dynamic digital demand? How is the role of management changing? Which resources and practices do ITSM practitioners have at their disposal to co-create value from digital investments? This talk will explore these questions and more. HDI conducts comprehensive annual research on almost every aspect of the service desk, from hiring, staffing, and salaries to metrics, frameworks, and technologies. This webinar will explore not only the statistics around the service desk, but what they mean in terms of industry trends and changes. How successful has the “do more with less” approach been? Are service desks hiring, or reducing staff? Is the workload shrinking or growing? What are the top metrics being gathered, and what do they mean? - What do service desks consider “must-have” technologies for supporting customers/users? - What contact channels are being used by customers to get support and request services? - What percentage of organizations are hiring for expansion of the service desk? - Which frameworks and methodologies are being used? - What are some areas where improvement is needed? Roy Atkinson is one of the top influencers in the service and support industry. His blogs, presentations, research reports, white papers, keynotes, and webinars have gained him an international reputation. In his role as senior writer/analyst, he acts as HDI's in-house subject matter expert, bringing his years of experience to the community. He holds a Master’s Certificate in Advanced Management Strategy from Tulane University A.B. Freeman School of Business. A look at ITSM and Digital Transformation with Simon Dorst and Michelle Major-Goldsmith. If we didn’t have IT service management, we’d be in a right mess. But how do you identify and articulate the benefits of ITSM in terms that business people understand? Starting with familiar ITSM notions such as utility and warranty, this talk explores how these relate to tangible business benefits such as more sales, higher prices, and lower costs and risks. Is ITSM just about keeping the lights on, and is it just as difficult to relate ITSM effort to business benefits as it is to say how much the cleaner’s broom contributed to last month‘s sales? This talk lets you decide for yourself. Join BrightTALK's Harriet Jamieson and Launch Product Marketing's Elisabeth Thomas as they review the latest developments in IT Service Management. From automation to ITIL 4, Harriet and Elisabeth will be covering where ITSM is headed in the coming months. As a highly technical expert, you have been successful because of your expert skills. People hire and promote you because of your talent and ability to solve hard problems. This is true. It's also not enough. What no one tells you is that you're only looking at one of the three factors that lead to career success. - Identify at least 2 practical things that you can do to improve your influence, get more support for your ideas and projects and gain more respect as a professional. ​We are in confusing times when it comes to adopting ITSM to deliver functional technology services to the business. ITSM seems to be out-dating itself with ever-changing operating models. This can negatively impact strategies to mature IT and the Business together. The role of IT provider over the last three decades of rapid technological advancement hasn’t adapted nearly enough to mature the company. You may of heard this many times - "IT must focus on aligning to the business and have a primary focus on service integration". Is your ITSM program working to achieve this focus? Most likely you are among the growing population that is failing or missing the target in order to achieve results with ITSM that ensures business quality and maturity. Listen to Beverly Weed-Schertzer as she explains a fresh perspective on ITSM from practical experiences spanning over three decades. Take back control of your ITSM program! Much is being said on how ITSM’s ultimate goal is a high customer satisfaction and great employee experience. Historically, ITSM teams have been using specific performance-based metrics that tend to be internally focused. Even though these metrics are important and remain relevant, they do not really give any insight into the customer experience. So to gain actual insight into customer satisfaction, you need to change your metrics. The question becomes: How do I change my metrics in an efficient way? In this presentation, Nancy shares some insights about why shifting your focus to measuring customer satisfaction is so important and what’s in it for your ITSM team. She discusses various approaches you can take to accomplish these goals and walks you through which metrics to focus on and how to implement this new strategy. Nancy Van Elsacker Louisnord is the President TOPdesk USA. She’s also a public speaker, a service management expert and a contributor to numerous leading industry publications and the TOPdesk Blog. What are the advantages of ITIL 4 in the modern world? Find out from Marcel Foederer - Lead Architect Team in Axelos and ITIL Trainer at ITpreneuers in this Future of ITSM session. ITIL has long been established as the de-facto framework for the management of IT services. However, the world has moved on. Our IT services are delivered differently and the tools we use to deliver them are commonly cloud-based or delivered by complex multi-vendor models. Like a prize-fighter, ITIL is being dusted-off for one last crack of the title, whilst new younger fighters enter the ring. Should we still be looking to optimise our processes using ITIL as a reference point? What other alternatives are available? This presentation will look at how to use ITIL as the basis for an effective IT operating model, and what else you ought to be looking at to successful deliver today’s complex digital IT services. Most IT organizations are currently working on transforming their existing IT delivery processes, with increasing use of Agile development methods (such as SCRUM), Continuous Delivery and DevOps. As a result of this transformation, traditional ITIL service management processes are being challenged for their relevance. ITIL processes are considered to be bureaucratic, slow and not relevant for the new digital ecosystem consisting. ITIL v3 also have some significant gaps as it didn’t cover the actual design and development of IT services (or products). But now in the beginning of 2019, Axelos introduced ITIL 4. Does this new version fill in these gaps? How to combine ITIL and DevOps? Does the digital enterprise still need ITIL 4? Or will your DevOps journey fail without a solid service management practice? This presentation will show how DevOps and ITIL should be combined in order to optimally manage the new digital ecosystem while at the same time being able to meet the increasingly stringent requirements imposed on IT service delivery. In this digital age, more and more work is being performed in Agile and DevOps contexts. Not only by IT teams but also in closer collaboration with the business departments. This agility serves customers, chain partners and own employees. While the processes, policies and rules in an agile organisation should be set up in order to facilitate agility, at the same time there is a must for organisations to remain compliant with the (stricter) laws and regulations. We see agile organisations delegating as much responsibility as possible to the operational levels of the organisation to achieve ownership and quick decision-making. GRC, ITSM and agility must be adopted and implemented throughout the organisation and be part of the 'corporate DNA'. The adaptability of the value chain enables organisations to react to changing demands from their stakeholders in the most effective and efficient ways. During this session participants will learn about the various experiences that ITIL 4 provides. Claudine is an IT management expert with experience in service management, security, risk, Lean, Agile and DevOps, in particular combining working methods that drives IT organisations to excel. She writes articles, develops trainings, gives lectures and realises projects on these topics. In addition, she is closely involved in the development of the new version of ITIL 4. “Motivation and enthusiasm in employees encourages me to work every day on better cooperation mechanisms leading to even better organisational performance. Experience in DevOps and ITSM transformations with a healthy dose of curiosity, empathic capability makes it possible to make connections within the organisation to realise this"
Stuart Rance, Consultant, trainer, author, Optimal Service Management Ltd.
ITIL 4 includes seven guiding principles, which can help you to make decisions and deliver great services to your customers. These guiding principles don’t just apply to management, they can help everybody in the organization. Stuart Rance will describe the ITIL 4 guiding principles with practical examples of how you can make them work for you. Stuart Rance is an IT service management and information security management consultant, working with clients all round the world. He is one of the authors of ITIL 4, as well as an author of ITIL Practitioner, ITIL Service Transition, and Resilia: Cyber Resilience Best Practice. He is also a trainer, teaching standard and custom courses in IT service management and information security management, and an examiner helping to create ITIL and other exams. At AXELOS we are passionate about co-creation of value: developing our products & services to truly meet the needs of end users, and bring value to both parties. That means collaboration; early testing; iterative development; listening to your stories… ITIL 4 is no exception. Find out about all the goodies in ITIL 4; what went on behind (and in front of!) the scenes during development, and how we are continuing to keep our Guiding Principles at the heart of what we do. I’ll talk about how the components of ITIL 4 address common challenges and opportunities at the heart of organisations, and how it leverages agile and lean concepts to deliver added value. I’ll give some insight on the reception from the market so far, and how YOU can help with further developments. Margo Leach is Chief Product Officer at AXELOS, and responsible for leading an amazing team of subject experts, market experts and development experts, to ensure our portfolios continue to deliver value to our customers and end users, and resonate in the market. Our purpose as an organisation is to help individuals and organisations achieve better outcomes, through the tailoring and application of best practice. Margo first fell in love with ITIL when she didn’t even know it was called that… back when she was developing and launching digital products and was very happy there were people reminding her she needed to think about ongoing service… and also make sure she didn’t break stuff. Self-Service ITSM portals are the corner stone to reducing overhead costs, promote fast tracks to customers for resolving issues, and reducing ticket volumes. It’s not that simple. Self-Service doesn’t mean cheaper and easier. Join Beverly as she discusses the benefits and drawbacks to Self Service and exploring the concept of A LA Carte options to Self-Service solutions! One of the most important objectives of IT service management is to deliver valuable services to the business. This can be achieved by breaking down traditional silos and applying standardized processes across the organization. However, demonstrating the effectiveness of service delivery with process measurements can be a challenge. Join moderator Elisabeth Thomas, and global ITSM experts Akshay Anand and Barclay Rae, as they discuss best practices for defining critical process measurements that encourage continual service improvement in order to ensure an effective, efficient, and profitable ITSM strategy. Learn which metrics are important to demonstrate that your ITSM strategy is effective, efficient and profitable. Blockchain, AI, IoT, Cloud, Robotics disruption technologies are exponentially accelerating the pace of change; are your ITSM strategies adapting fast enough? What if – there were metrics that could help you tap into and leverage your current investments, methods and human capital to adapt more quickly. What if – the metrics formed a performance improvement model that was self-organizing, just-in-time, low entry cost, flexible and elastic? What if – the performance improvement method was repeatable and inspired innovation, creativity and outside the box thinking? Would it be worth the hearing about it? Leading organizations are using Lean IT measurement models to better understand how to measure throughput, efficiency, effectiveness and quality of ITSM services. This session is about finding metrics most relevant for your situation to inspire change. Where will automation take IT Service Management in 2019? From AI to machine learning and process automation, there’s a whole host of new capabilities that will ensure customer satisfaction, robust IT security practices and flexible deployments in service management. Join leading experts in this open discussion to learn how to adopt modernized approaches and embrace innovative practices and technologies for an effective and profitable Digital Transformation. Selecting an ITSM tool to support a providers core framework of practices can be horrendous. Investments in ITSM tools are costly, but are they returning efficiency and quality? Businesses make an investment in tools which most likely aren’t aligning to produce the right results. Join Beverly to learn how to avoid the tool trap and ensure ITSM automation performs well! IT service management forms the backbone of any forward looking IT infrastructure. Whether it’s the latest trends, techniques or strategies, the content in this channel will help you optimize your organization's IT operations.